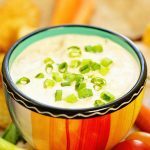 Creamy tangy onion dip with onions three ways: sweet onion, green onions and dried onion flakes combine with yogurt in this healthy delicious onion dip recipe. The yogurt gives it tang with a bite from Sriracha in this quick and easy recipe! Dippers - chips, carrots, cherry tomatoes, celery, breadsticks. Add the yogurt and mayonnaise to a small bowl. Grate the sweet onion, you only need a tablespoon. Thinly slice the green onions, both the white and green. Reserve a teaspoon of the green to garnish. Serve with your favorite dippers! Carrots, celery, snow peas, breadsticks, even onions rings. Enjoy!